The electric bike, which can reach a speed of 40mph, can currently travel for 25 minutes and can carry up to 300kg, police say.Dubai police hope it will one day be used to get officers quickly to the scene of accidents and helping them avoid traffic. Earlier this year, Dubai’s first robot police officer joined the force. 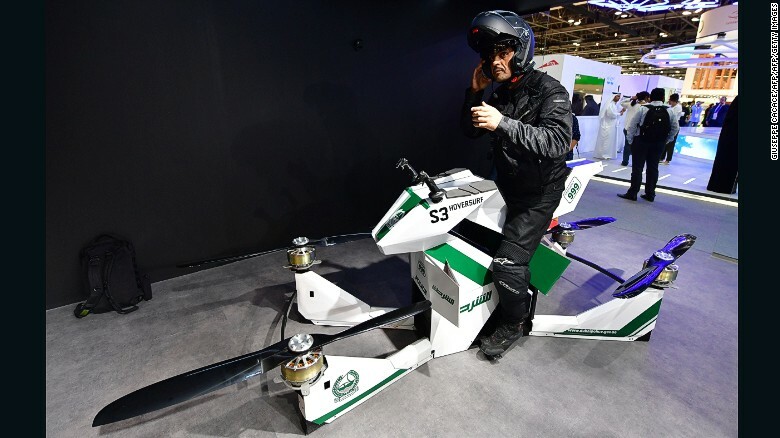 Dubai police are testing out futuristic hovering motorbikes which they hope will one day from part of its hi-tech patrol fleet. Not content with Ferrari and Lamborghini supercars, the tech-savvy force are now looking to invest in innovative new ways of fighting crime and protect the public. 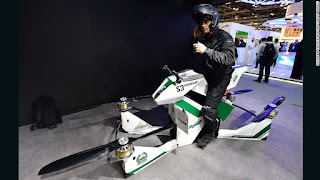 The hoverbike concept, developed by Russian company Hoversurf, was unveiled at Dubai’s Gitex Technology week.The bike “passed successful tests in extreme conditions - dust and heat” said its manufacturers, who released a YouTube video of it in action. The electric bike, which can reach a speed of 40mph, can currently travel for 25 minutes and can carry up to 300kg, police say. Dubai police hope it will one day be used to get officers quickly to the scene of accidents and helping them avoid traffic. Earlier this year, Dubai’s first robot police officer joined the force. Dubai police have outlined plans for robots to make up 25 per cent of its force by 2030.